Telephants, epic longboarding crashes, struggling against the system and some pretty epic motivational words. Wonderful Oly Joplin’s interview will have you feeling all types of good. Good morning Oly! How are you? Good morning Hoooo! I’m super fine, surviving. Haha! I wish we were struggling against zombies, the situation in my country has made us warriors, fighting every day to survive and keep skating. Fighting to survive, because the situation is not good. There are lots of economical, social and political problems, and of course we are in the middle, fighting to do what we love. As a skater, how are you fighting? In Venezuela, it’s very difficult to buy equipment, such as; wheels, boards, gloves, grip tape, leathers. Because of the economical issue (a rigorous foreign exchange currency control), there is no business for skate shops to import what is necessary to practice the sport and support the scene so… We as skaters do what we love with the equipment that we already have. How do you get new wheels? It’s complicated, I got wheels when it was not so difficult to get them. And right now I get some help from a Costa Rican Team (LRV wheels) who sent me two sets of wheels. It’s pretty hard because longboards can be very expensive. What would happen if you didn’t stand for what you believe in? Well, that will be living a boring life, because I wouldn’t have any motivation to push myself to be a better person or human being. Tell me about the Oly you want to be. Actually, I’m the Oly I want to be, very simple, sometimes sarcastic, worried about others, fighting for gender equality, teaching values wherever I go, motivating myself to be authentic and passionate for what I do with love. I’m very happy with the Oly that I am. What was it like growing up in your city? It’s kind of difficult if you are an authentic person, because you’ll end up as the weird one but, without a doubt, in my city even though it is difficult to be what you want to be, there are a lot of people who will believe in you and also support what you do, there are lots of kind persons there. How did you find skateboarding? I was searching on internet back in 2006, and I found a video that blew my mind. 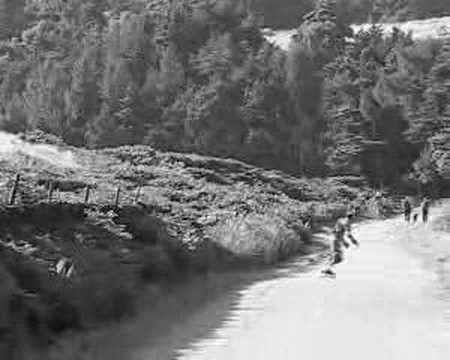 It was an old lush longboards 2006 video, and I said to myself I want to practice that because it seems to be a way of fun and reminds me of the old videos and story about the Z-boys, like surfing and going fast. What were you riding in the beginning? The first board I had was a Longboard vision 48’’ and it was super fun riding it, such a huge longboard to dance and have fun cruising fast, that was a long, long time ago haha! I loved that deck. What adventures did you and the vision ‘48 have together? Lots of adventures, but the epic adventure was the first time I skated with my ‘48 vision, I had a huge crash skating fast in the only hill that my city has. We were like little kids on a roller coaster. I wanted to skate that gnarly hill at night, as I went down, it was going faster and not braking, soon I got an epic speed wobble which threw me and made me slam my face into the pavement! I got a serious head injury and big trouble with my mom. My friends were like OOOOOOH GOSH! Ouch! How bad were your injuries from that crash? I blacked out at that moment and then I don’t remember, but it was definitely necessary to wear sunglasses for a month to avoid getting some obvious scars in my face. Why did you decide to come back after eating it so hard? Because whenever you start something you have to finish it, and also because it represented a challenge! In order to overcome other things in life that would make me grow as a human being, I had to beat that hill. So, after that crash, I started skating as soon I was fully recovered and I haven’t stopped since then. Who else was skating in your country when you started? I’m From Monagas – Maturin, a little flat city in my country with just one hill. There were a couple of budds who were skating with me, it was fun because I was the only girl with them. And in my country there were some old-school guys doing downhill and I remember that because there were super kind to me and they introduced me to downhill all the way, I loved them actually. Who are the legends of Venezuela? Woooooooah! I love this question! Definitely my old school friends, Andres Mora, Manuel Sarmiento, Norberto (Pantera). They were the first ones that started skating when they were children in vert skating, and recently they took downhill so they could keep skating in their senior age. Skating has kept them close. I am very thankful to Andres Mora and Manuel Sarmiento for giving me some wonderful advice and pushing me to practice this amazing extreme sport. How did they contribute to the skater you are today? By motivating me all the time and also thanks to them I got my first proper set-up proper for downhill skateboarding, they also taught me how to tuck and go faster. What was your next board after the vision? A comet voodoo doll with a set of orangatang wheels, a rogerbross footstop, a pair of paris truck, and a redbones bearings. Did you approach the sport differently after that first experience? Oh hell yes! Because it made me conscious of the risks of not wearing a helmet. What’s your advice to people new to skating? Maintain your authenticity, don’t do it to get famous or to be accepted. Do it for passion and as something that lets you express whatever you want. Stay humble and respect others. When did you first skate down the hill again? I started again in Caracas – Venezuela in 2006, a year after my crash. It felt amazing! I’ve got no words for that, an amazing experience, such joy and happiness and fear and laughter and pee and poo jk! haha! Your story is very similar to Pam Diaz’s! Really? Wow! I haven’t ever talked to her but I have heard about her, and she seems very kind. After you conquered your injury hill, where did you skate? I skated at ¨La Cota 1000¨ in 2006 with my old school friends. It’s a place that is closed every Sunday from 6am to 1o for the people to do activities. Where is the longboarding capital of Venezuela? There’s no such thing as Capital of longboarding, in every state there is a community that develops and enjoys their local hills, and every state has different characteristics in their hills, that makes Venezuela a very diverse place to practice Longboarding. Who organises events in Venezuela? Right now there is a lack of events in Venezuela because of the economic situation, but there are few riders who makes an effort to support the scene doing longboarding events. Did you have more events in the past? Of course! In the past there was more support from skateshops, private companies and international brands and I participated in almost every event. Which ones did you attend? Right now I don’t remember a few of the names but there were a lot indeed: Cota 1000 first contest, Cota 1000 entre panas I, II, 1st carretera vieja la guaira inverse contest, copa caliber, vibras mag contest, And so many others that I don’t remember the names, a variety of slide jams since 2008. Yes! Most of those events were races and I had been on podium in most of them, doing DH. How do you stay stoked with this lack of events? Just skating with friends and for fun and giving motivational meetings about the longboarding scene in school and universities. Who is in your skate gang? Just shredding with a couple from friends of Highest skate-shop, they are pretty gnarly and they have such a wonderful soul to share with. Yes, I started to talk about extreme sports and let them know how such a radical sport is developing and motivating also to know more about it, by explaining the basic characteristics of longboarding, making demos and talking about skating safely and responsibly. Also, through this I talk about the importance of being authentic and humble, reaching values, being respectful, and doing it not for the applause but for fun. I also motivate people to organise themselves to increase places to ride and I also emphasise the need to skate safe because we’ve lost a couple of friends doing downhill. So, for me it’s important when I have this opportunity to talk about skating safety, and keeping with a career because here in Venezuela you can’t live from an extreme sport. It’s lame to say it, but its the truth. I started since I hosted ¨Longboard Girls Crew OPEN Movie¨ in February, here in Venezuela. A group of surfers wanted me to give a speech in their University, since that speech I’ve been in high schools,Universities, interviews, etc… Right now I’m planning to visit children with cancer to give them an amazing day to share. Wow. What do you hope to achieve with these talks? You have to dream big if you want to achieve things. Definitely I think that it’s more that I learn from those speech as a human being, I wanted to increase the receptivity of the extreme sport by giving that such a good image here, of course I want more support for longboarders, ¨Education is one of the strongest gifts we can give to a human being¨ Malala, also I want gender equality, making the people know that females are able to practice extreme sports as well as anybody, and also increase the respect for people who are skating or biking in open roads. Who else do you speak to? I mostly speak with young people but in those meeting there are lots of adults and children, it’s a variety of people. And I’m happy with the result, they are very gentle. Yes, two of them. And that was pretty sad. Hugs. What is life like for a female skateboarder? You have to be strong and serious but never stop having fun because there will be people who will love you and who will hate you for no reason, and it is part of life itself to deal with it with kindness, and in a sport practice mostly for men, you have to maintain yourself, be serious and strong, having fun always and doing more than talking about what could be. Actions speak louder than words. What are the most fun things to do on your skateboard? I definitely love going downhill because I like the speed and the feeling of handling tight corners, dancing and cruising is always fun but I love the feeling of going fast. I love to meet people around my country doing it and also love the landscapes that it brings me travelling doing downhill. Is travelling important to you? Yes, It is. I spend most of my entire life travelling doing this, It brings me some kind of peace, it doesn’t matter if I’m alone or with friends, I love traveling knowing new places, meeting new people, that makes me find myself as a human being. It’s more like spiritual. How do you feel when you’re going FAST? It’s an emotion that can’t be described, for me its like nirvana because you have to be focused on what you are doing and at the same time you’re concerned about the road, your board, and your thoughts, when I’m doing downhill I don’t have time to worry about external issues. What are the best races you’ve been to? One of the best races that I been to was in ¨Festival de la Bajada¨ in Bogota – Colombia, it brought me lots of experience and friends and the way the longboard community shares among itself. Another one was the ¨Copa Caliber¨ was one of the best races here in Venezuela. Lots of fun and a pretty gnar road. It was pretty lazy, but I had fun skating and travelling. Hell yes! Recently I went to a place far from the city (Caracas), it’s one of my favourite places in Venezuela, I went with a group of friends, we were shredding hard, having fun, skating in the rain and it was a beautiful place for doing downhill; amazing roads, curves and the landscape was beautiful, there was lots of mist, it was such a good moment. Oh! I wish, it’s difficult but not impossible, I’d love to go to Europe and have fun there. It will be a dream come true to travel to Europe and the US for the races. And of course the South American contests. What setup are you riding right now? I ride an Arbor Highground, with Ronin 174mm precision trucks, ganster griptape, sector nine ceramic bearings and a variety of wheels one of my favourites are LRV WHEELS from Costa Rica. NO, I just have a little help from my friends from Costa Rica (Colacho) they gave me two set of LRV Wheels and they are such an incredible team. What do you do when you’re not being a rad skater? Lots of things, I’m a teacher, I like to play music, share with my gang and family. You should Interview to an awesome friend of mine, Jacky Madefrost from Venezuela, she is a wonderful soul. 7 – why did the chicken cross the road? 9 – what would you choose as your last meal? I was thinking about to eat a huge bowl of salad and water. A tiger and an Elephant, that would be rad. Telephant! Thank you for sharing pieces of your life with us. I can only imagine how tough it is there. Stay strong and spread the stoke! Thanks to you for the opportunity and for knowing more about Venezuela and people who shred. A bunch of love Homie. Stop waiting for things to happen, go out and make them happen. Do something today that the future self will thank you for, respect others, have fun, do what you love and be kind.